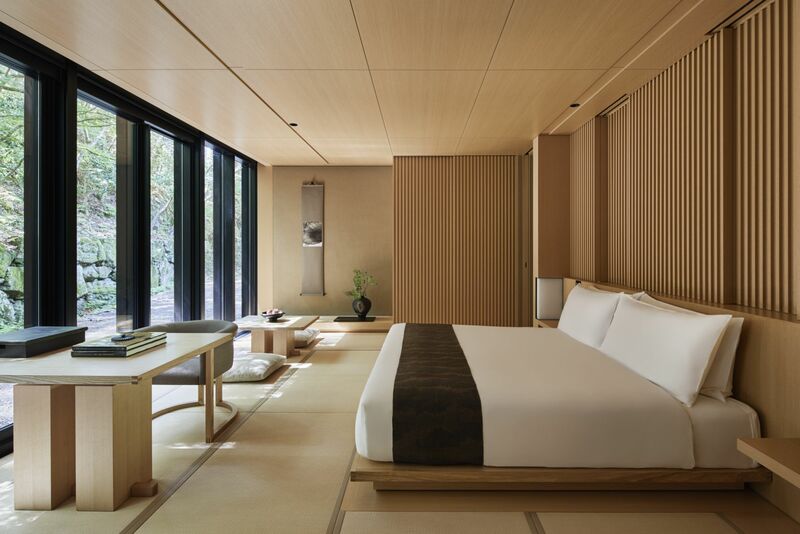 After a contemporary hotel at the Otemachi Tower in Tokyo and a rustic ryokan-inspired retreat in Shima-shi, luxury resort and hotel collection Aman is expanding its presence in Japan with a third property—Aman Kyoto, and its location is simply breathtaking. Hidden away in a secret garden at the foot of the Mountain of Hidari Daimonji, north of Kyoto, the 80-acre property in the Takagamine district is steeped in culture and heritage. Just a stone’s throw away from the UNESCO World Heritage Site of Kinkaku-ji Temple, the forested grounds were part of an artistic community that gave rise to the historic Rinpa school of painting in 17th century Kyoto, and eight acres of manicured gardens—tended over many decades—belonged to one of Japan’s most respected collectors of the obi (the ornamental sash for a traditional Japanese kimono), who had originally planned to build a textile museum within the garden for his collection. The ethereal landscape, dotted with colourful yama momiji maples and Japanese cedar trees and enclosed by a small running stream, now provide the foundations for Aman’s resort. Designed by Singapore-based Kerry Hill Architects—who also brought Aman Tokyo and Amanemu into being—the resort is divided into a series of distinct pavilions: Arrival, Living, Dining, Spa Pavilions, four Guest Pavilions with 24 guest rooms, and two individual Pavilion that house a pair of two-bedroom villas, overlooking the forest canopy. Aman Kyoto is a contemporary and minimalist reimagining of Japan’s traditional inns, with floor-to-ceiling windows, tatami mats, and furniture pieces exclusively designed for the property. In true ryokan fashion, each guest room also boasts ofuro bathtubs made of native hinoki cypress wood for a relaxing soak. Gastronomic creations await in the Dining Pavilion, where Japanese haute cuisine is crafted from hand-picked local produce. In the Living Pavilion, a central fireplace and glass doors opening onto an ornate stone garden sets a peaceful and relaxed atmosphere for meals throughout the day. Enjoy home-cooked Kyoto obanzai-style cuisine in the pavilion, or opt for a bamboo picnic hamper to dine al fresco amidst the spectacular views. Of course, no Aman retreat is complete without the Aman Spa—at Aman Kyoto, experience the holistic benefits of Japan’s ancient wellness practices. The spa’s extensive menu of treatments tap into Japan’s natural apothecary, such as Kyoto green tea, Tanba Kuromame black beans, local sake, cold-pressed Camellia oil, and Kyoto silk cocoon. End with a relaxing soak in the traditional onsens, filled with local spring water help to heal and rejuvenate weary travellers. Aman Kyoto opens November 1, 2019.